If my fellow Americans recall their American history, you remember the state of Virginia suffered from a great deal of political turmoil during the Civil War. As a result, residents from West Virginia decided to secede from Virginia and create a new state. This was not a quick and easy process. In fact, from the first stirrings of creating West Virginia until the day the federal government recognized West Virginia as a state, took about 60 years. Today, there is a great deal of political contention in the state of California. As a result, there are a number of movements among California residents to secede from California and create a new state. Treasonous socialists are looking to leave the United States and turn California into an independent country. As a patriotic American, I do not support them, as they are traitors to the United States. Others are proposing the creation of three states – Northern California, Southern California and Central California. While this is a better solution, it’s unrealistic. Dividing California into two states offers a difficult challenge. Dividing it into three states only further complicates things and therefore makes it less likely to succeed. Plus, that type of secession doesn’t unite the proper political demographics. I can’t support that either. In the past few weeks, I heard about a movement that I passionately support. 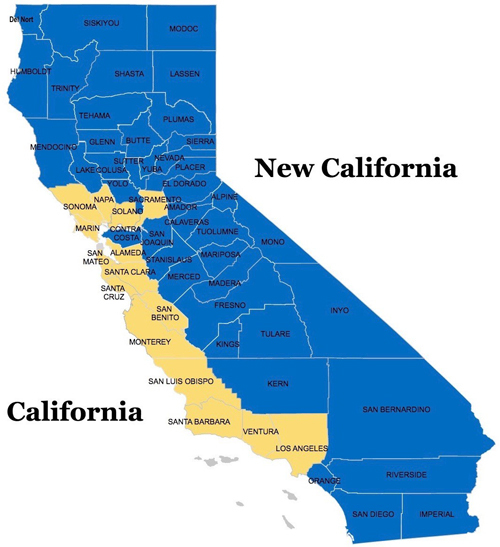 The idea is to create a state called New California from the central and eastern counties of California, while leaving the coastal cities and counties untouched. In my opinion, this is a brilliant idea. It’s simple. It requires none of the coastal counties to change anything. They would still remain California. But the rest of us, the patriots who believe in the Bill of Rights, devoted Americans who hold the Declaration of Independence as sacred, and who have sworn to kill and die in defense of the Constitution, can live as free men and women in New California. Personally, I have complete faith in New California and I think it is only a matter of time before it becomes a reality. Hopefully, unlike West Virginia, it won’t take 60 years to happen. Being inspired by the ideology of this movement, I decided I could contribute by designing the state flag of New California. There was one being used already, but I felt I could improve upon it. Most modern flags are designed to follow rules of color combinations, established centuries ago, from medieval coats of arms. The artistry of drawing and establishing these guidelines was known as “heraldry”. 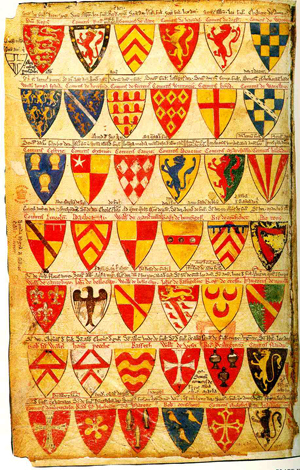 All heraldic designs used a number of primary colors known as “tinctures”. These tinctures were divided into two main groups. There were two “metals” and five “colors”. One of the most basic and important rules regarding tinctures in heraldic design is to never overlap colors or metals. The reason being – the human eye has a difficult time seeing the contrast between these color combinations from a distance. You can only place metals on colors, or colors on metals. The whole point of flags and coats of arms painted upon shields was to quickly identify friend from foe on the battlefield. When you were preparing to fire an arrow at someone 600 feet away, you had to make sure the person holding that shield was your enemy, not your ally. 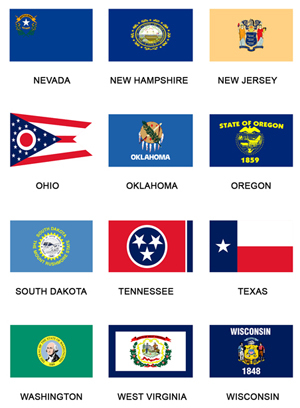 Modern state flags follow these rules as well. For those who may think these “rules” are outdated and never used anymore, you use them every day. Modern traffic signs follow the standards of “colors on metals” and “metals on colors”, as a way to assure they can be read from a distance, while driving at high speeds. Here, we can see the original New California flag design proposed by Sutter County, California. Based upon the previous explaination of the history of heraldry and some of the rationale and reasoning behind flag designs, you can quickly spot numerous flaws in the layout of this flag. The field is an odd coloring of maroon, instead of a primary color. Plus, it uses a gradient, slowly blending from a dark, almost black maroon on top, to a much lighter maroon on the bottom. The center stripe is azure on top of maroon. This is a color atop a color and goes against the rules of vivid contrast. Likewise, the canton in the upper left contains a gold star in a silver field, which is a metal on top of a metal. The gold star is not a solid color, but rather an embossed image with a beveled edge. Again, this kind of embellishment is never used on flags or shield devices. Colors are solid, so they can be easily seen and reproduced. Gradients and beveling are not design elements that are ever used. 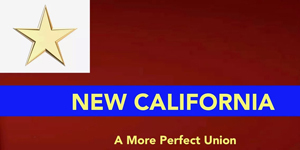 The text of “New California” is strangely offset. 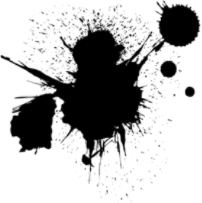 Instead of being centered in the stripe, it is pushed to the right in a way that looks unbalanced. The motto of “A More Perfect Union” conforms to the tincture rules properly (gold atop a color) but again, it is offset in a rather uneven way. Pushed slightly to the right of center, it feels unbalanced and awkward. Despite the numerous tincture flaws with this design, the overall layout is very balanced and aesthetically pleasing. In my design, I have tried to mirror some of these design elements (a similarly-positioned stripe and canton) in honor of this first flag design. There are numerous historical flags which served as an inspiration for my design of the New California flag. 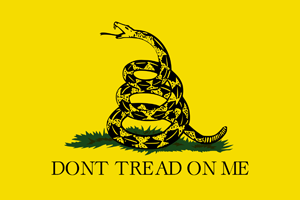 First is the “Gadsden Flag” from the Revolutionary War. This symbol of the rattlesnake was one of the first flags used by American colonists as the initial stirrings against the British Empire began. Another inspiration is the current national flag of the United States of America, Old Glory with her blue canton of 50 white stars and 13 stripes to represent our founding colonies. A flag that has been adopted in recent years as a way to honor the efforts of police and firefighter first responders are the “thin blue line” and the “thin red line” flags, which are black and white versions of the American flag, with a single stripe turned to blue or red. 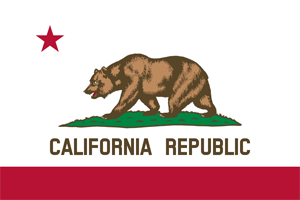 Finally, there are design elements from the California State flag (namely the upper left star) which serves as a reminder of the origins of the state of New California. Here is my proposed design for the state flag of New California including all the reasons and symbolism behind the design. 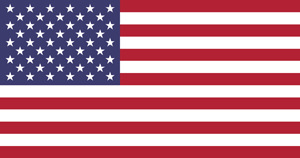 First, the aspect ratio of the flag is 19:10 which matches the current national flag of the United States of America. The foundation of the flag is a yellow field, in honor of the “Gadsden Flag” from the American Revolution. In the upper left is a blue quarter, matching the blue used in the canton of Old Glory. For balance and symmetry, it is a quarter instead of a canton. Beneath the quarter is a red stripe 1/13 the height of the flag, as a way to represent the current American flag stripes. This design also respects and pays homage to the “thin red line” and “thin blue line” honorary flags for police and firefighters. Within the red stripe are 13 five-pointed stars (known as a “mullet” in medieval heraldry) to honor the original 13 colonies of the United States. 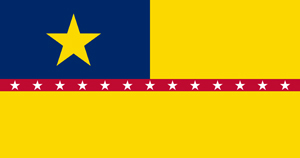 Finally, the blue quarter contains a large yellow star to represent an individual state and an acknowledgement hearkening back to the red star on the California Republic flag. Coloring conforms to medieval heraldic rules of tinctures and metals for maximum visibility. The red and blue colors are designed to match the colors of Old Glory as faithfully as possible. Based on color information published by the American Legion, these are the color standards which should be used.